After Switzerland – Learning Political Lessons is Key! 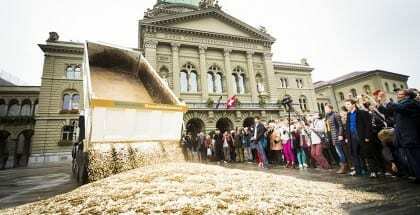 Yesterday, the Swiss voted on the proposal to provide a basic income sufficient to allow the people to live in a dignified manner and participate in public life. The proposal was voted down with 23.1% of the voters in favour and 76.9% against. With a participation rate of 46.3% that boils down to little over 10% of the Swiss population supporting basic income. No doubt the Swiss campaigners as well as those watching the referendum closely will be conducting a post-mortem of what happened and how to interpret these results. I for one believe this is a result that the Swiss campaign should be proud of. A 23% yes vote in a popular vote against the background of pretty much unanimous establishment resistance is a major achievement. Yesterday’s vote breaks firm ground for a basic income debate in years to come. The Swiss debate is not over, not by a long shot! Perhaps even more importantly, as many commentators have rightly pointed out, the Swiss campaign – one of the most creative and professional I have seen in a long time – managed to create wave after wave in the media. With policy attention following media attention, it is fair to say without the Swiss we wouldn’t be where we are now in Finland, Netherlands, Canada or France. So for that, Switzerland we thank you! But appreciating what Switzerland has achieved shouldn’t prevent us from asking important (and perhaps some hard) questions about what happened or didn’t happen in the Swiss campaign. What political strategy lessons can we learn from Switzerland? And how can we use those lessons in countries as diverse as Finland, Canada or Portugal? We can all learn from the Swiss experience, and conversely this is the time for the Swiss campaign to educate us on the upsides and downsides of their strategies. One obvious point of contention – one that affects every jurisdiction campaigning for basic income – is whether to promote the principle of an unconditional and universal basic income granted or instead to focus on a concrete proposal, including a clear indication of how high the basic income will be and how it would be funded. The Swiss referendum asked voters to vote on the principled argument, leaving both amount and funding to be determined by legislation. This may put off some voters who are risk- and, above all, ambiguity-averse (preferring current certainty over future possibility). Partly to counter this, the Swiss campaigned for a basic income pitched at 2,500 Swiss francs (approximately €2250, £1,750 or USD2,555). Many no doubt will argue that this high sum traded-off uncertainty for genuine anxiety amongst many voters, and that a lower level of basic income may have been a more prudent approach. The reality is we don’t really know, and for that reason a genuine post-mortem would be a very useful step going forward. I’d like to point out another lesson from the Swiss referendum, and perhaps an uncomfortable one for most basic income advocates. In recent months a number of polls have been put forward indicating growing levels of support for basic income. Most recently there was the Dahlia Research poll which suggested on average 64% (of surveyed EU countries) were supportive of a basic income. These results are regarded as indicative or even evidence of robust basic income support. But the Swiss case puts a sobering note here. A poll conducted in April asking 20000 Swiss citizens their voting intentions found 40% intended to vote in favour. The reality turned out quite different, with only 10% of Swiss coming up to vote and then voting yes. This shouldn’t surprise us because political polling is a notoriously difficult enterprise, and polls around basic income are easily influenced by framing of the questions as well as real-world events. For an example of the latter, the Finnish working group coordinated by Kela found that Finnish support for basic income decreased quite radically once questions about the amount of basic income are paired with corresponding questions about the taxes needed to fund it. This is also why we should really stop being overexcited by polls claiming to offer evidence that only 2% (or 4%, or whatever really) of surveyed individuals would stop working: the so-called social desirability bias means that polls are simply the wrong tool to answer the question of what people would do when they get a basic income. The bigger question – and lesson to be learned from Switzerland – is whether we have a really good understanding of the level of support for basic income amongst ordinary citizens as well as key policy stakeholders. Basic income support is growing as more people become familiar with the idea, but there is still a lot of work to be done understanding how to translate this support into a robust political constituency. I think our Swiss friends will be able to help us understand the next steps to push basic income onto the policy agenda. Jurgen De Wispelaere is a Visiting Research Fellow at the University of Tampere (Finland), where he is part of the Kela-led research team preparing a national basic income experiment in Finland. Jurgen De Wispelaere has written 7 articles. Jurgen De Wispelaere is a former occupational therapist turned political theorist and policy scholar. He is an ISRF Political Economy Research Fellow and a Policy Research Fellow at the Institute for Policy Research (Universiy of Bath). Previously he worked at the University of Tampere (Finland), forming part of the Kela-led research team preparing the basic income experiment in Finland, and before that at universities in Montreal, Barcelona, Dublin and London. His major research interest is the political analysis of basic income, which was the topic of his doctoral dissertation at the University of Tampere. Jurgen has published extensively on basic income in leading international journals as well as specialist edited volumes. He is a founding co-editor of the journal Basic Income Studies (with Karl Widerquist) and co-edited Basic Income: An Anthology of Contemporary Research (Wiley 2013). He is currently working on a short book on basic income experiments (with Evelyn Forget) and preparing The Routledge Handbook of Basic Income (with Louise Haagh). Jurgen was the co-convenor of the 2014 BIEN Congress in Montreal and a member of the local organising committee of the upcoming 2018 BIEN Congress in Tampere. He is a big fan of death metal and believes a basic income would provide much needed support for the underground music scene. I’ll just say this. When the Governments and Insurance Companies cant “afford” to cover peoples losses due too “the peoples love for materialist and capitalist things”, their ( Will Be ) a forced change. For instance, here in America, after the financial system had short changed folk in both Katrina and Sandy Hurricanes….. I “wonder” how the country will cover, or the insurance companies, when the building and real estate expand even more due to population growth. Not to mention, the “stuff” people fill their homes with that end up at the land fill after a catastrophe. For instance, if a “newly built home”, most likely on a 30 year mortgage, is destroyed by flooding or other.. because of the “Natural Roulette Wheel” which when the number hits, is usually “not good for the owner”…. will MOST DEFINITELY happen more often. Especially which a change in climate. Especially when many things in government and societies are becoming “privatized” which in basic terms the operators/managements salaries/bonus’s are FAR GREETER than any government official can earn. Its SAD when some of these Non-profit organization CEO’s can make even more than a Presidential Tax Paid Job that is their to manage a country vs just a small specialized operation… Either way… I SEE a Forced Change in the future to a “Star Trek” type Basic Income Guarantee… cause frankly… Robitic Arms and other Automated Mechanical Machines can work 24 hours strait, and don’t need retirement or benefits… just takes a maintenance mechanic to watch over 20-50 machines that can do hundreds of “human jobs”. Future is here. Is what it is. Don’t matter if the upper 40% have jobs and can live fine… when your talking about millions of people in society. When 20% are having a “very hard time” out of a million.. thats 200,000 people… Its not like the days of 100-500 people per town, and all they had to do was move to another continent to find a new patch of land and start a farm. That option, is over. You get even 100k worth of people marching in a city of a million… well… that… is VERY noticeable. PS… sitting down with a Psychologist and Anti-depressants does not help people pay the rent or find an affordable place to live… that’s Americans fix of course… by a bunch of folk that have pill investments, paid by government cause they are poor of course, along with the talk sessions… through 1% investors or 401k’s. I’ll just say “THANKFULLY” there was no Psychologists or Pills in the 1920’s Depression or this country would have FELL. It will take years to implement a realistic universal basic income-model. No reason for supporters of the idea to regard this as a set-back. The amount was unrealistically high and leaving it for “die Gegenspieler” to decide the funding of the reform, as well as the rules, should not have sold the proposal to the public. And it didn’t. What about “universal” (general)? This was yet another sort-of-negative-income-tax-scheme. Based on income some will get it and some will not. Criminals with no taxable income will get it. Early retireing lotterywinners will get it. Semi-crazy leftwing activists will get it. No, get real! Support a real UNIVERSAL (GENERAL) Basic Income. That is a system for everyone. Can’t get more fair than that. 1. Get together in your local/national UBI-Community. 2. Investigate this issue thoroughly. Yes, it will take months, I know. 3. Work out a detailed proposal. How much and why, who will be qualified to get it and why, how is it funded and why, what will be the impact on society and why, what adjustments in society has to be done and why. If members can not agree, work out two detailed proposals. 4. If the UBI-Community can’t present a serious UBI-proposal, then there is no serious UBI-proposal. 5b. If members can not agree, found two political parties. If one proposal would look unrealistic, it would help the other one to look good. 6. Present the proposal/proposals for debate. On website, in media, in public meetings, etc. 7. Attend national general elections. I think we should not underestimate the fear that the migrant crisis is spreading in Europe. One could say the swiss are standing on their mountains, looking at the scuffles at the borders of their neighbours, and telling each ohter: “whew, good thing they all wanna go to Germany and Sweden!” Many feared that a guaranteed basic income would divert that whole flood of refugees squarely to Switzerland. many swiss already grumble about the germans, french and italians coming to Switzerland to work -which they freely can, because Schengen- and there were many afraid all of the EU would try to get a Swiss job. Also, I think the proposed amount in combination with the fear as described above, made it go down. It might be, that we as a society first need to have a severe crisis (nope, the one we are now in is not sever enough yet) to change ourr thinking. When a big part of the jobs are really gone forever and unemployment is understood not to lower anymore because of that, then people might start to think about it seriously. I have yet met far too few people who debate the guaranteed general income seriously. It is still laughed off. Also in the Netherlands. I wish america was making as much progress as the swiss.